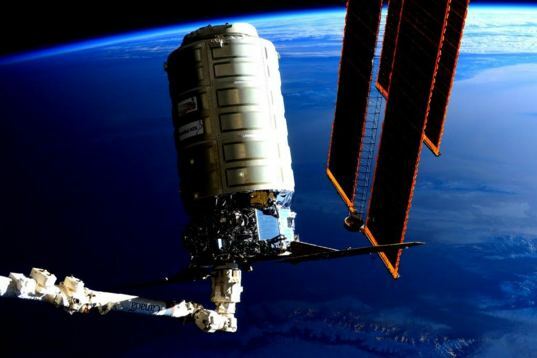 Early this morning, astronauts Scott Kelly and Tim Kopra released a Cygnus cargo spacecraft from the International Space Station. Cygnus, which arrived in December, spent more than two months on orbit—longer than originally planned, giving the crew more time to fill the spacecraft with trash. Flight controllers at Orbital ATK in Virginia will send Cygnus into Earth's atmosphere for a controlled reentry Saturday morning. The next ISS resupply flight is scheduled for Tuesday, March 22, when a United Launch Alliance Atlas V rocket sends another Cygnus craft into orbit. 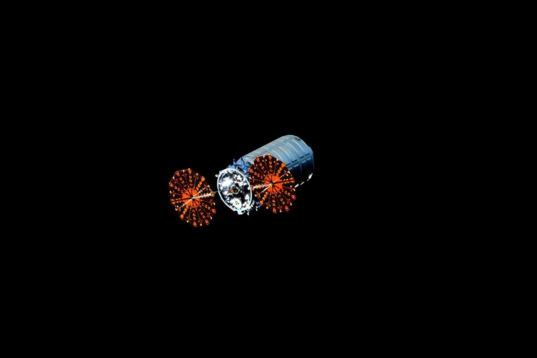 Prior to that, one-year cremembers Scott Kelly and Mikhail Kornienko, along with cosmonaut Sergey Volkov, will return to Earth on March 1. About two weeks later, NASA astronaut Jeff Williams and cosmonauts Oleg Skriprochka and Alexey Ovchinin will launch to the station aboard Soyuz TMA-20M, joining the crew of Expedition 47. 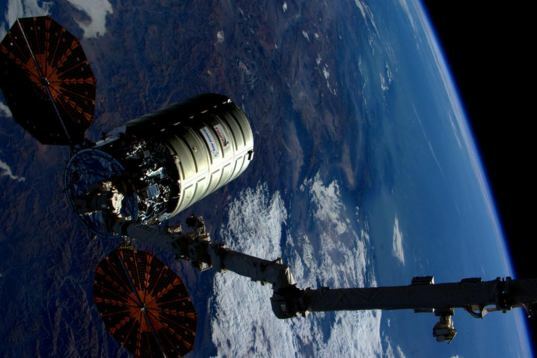 Here are some images and video from today's Cygnus departure. 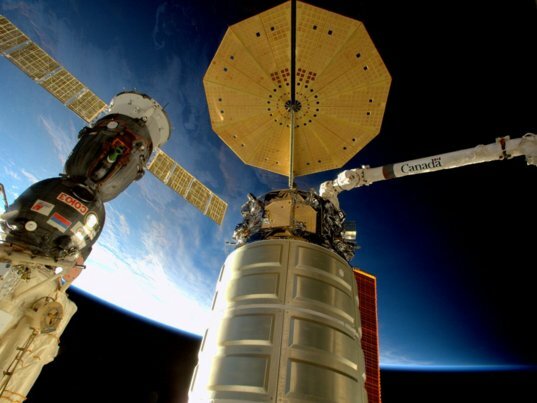 Cygnus OA-4 slips into darkness after being released from the International Space Station. 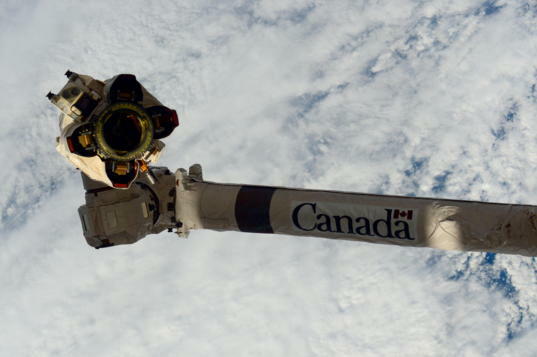 The International Space Station's robotic Canadarm is empty after releasing the OA-4 Cygnus resupply vehicle. Beautiful. 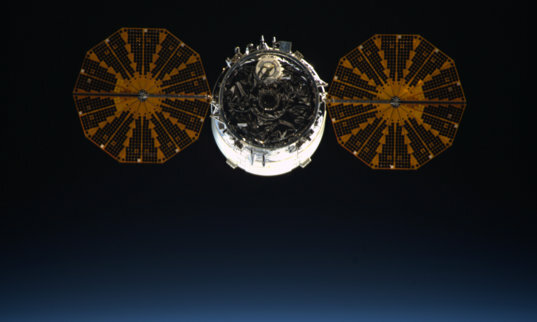 I wonder, for a controlled re-entry Cygnus needs power but does it need both of those gorgeous solar arrays?... if battery power would suffice, would it be advantageous to use/store these arrays on station rather than burning them up? Having access to a growing supply of solar arrays might prove to be useful if we expand our infrastructure into LEO or cis-lunar space. If not, could they supplement the ISS power production in any meaningful way if the benefits outweighed the risk of cannibalizing these items?